Both leaders were keen to signal a new beginning in Russian-French relations that have been under considerable strain recently, says the BBC's Hugh Schofield in Paris. French President Emmanuel Macron says he held a “frank exchange” with Russian counterpart Vladimir Putin in their first face-to-face talks. The pair discussed “disagreements” in the meeting, held at the sumptuous Versailles palace near Paris. But Mr Macron said he wanted to work with Russia over the conflict in Syria in the struggle against terrorism. Meanwhile, Mr Putin said he wanted to strengthen economic ties with France after the restrictions of recent years. 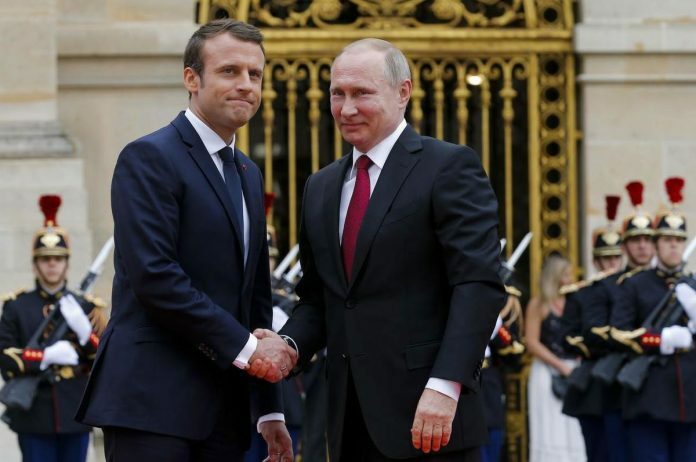 Both leaders were keen to signal a new beginning in Russian-French relations that have been under considerable strain recently, says the BBC’s Hugh Schofield in Paris. Mr Macron’s election team accused Russian agents of launching cyber attacks against them during his campaign for the presidency. Tensions have also risen over the conflicts in Ukraine and Syria, where France and Russia back opposing sides. What did they say about Syria? France is in the coalition backing Sunni Arab and Kurdish rebels opposed to Syrian President Bashar al-Assad, who has strong military help from Russia and Iran. However, in the joint news conference after Monday’s talks both leaders said there were opportunities for their countries to work together more closely. Mr Macron said he wanted France to “strengthen” its “partnership with Russia” in its fight against so-called Islamic State (IS) in Syria. He said he favoured “a democratic transition” that would “preserve the Syrian state”. But the use of chemical weapons would be a “red line” that would draw an “immediate response” from France, he added. Mr Putin agreed that uniting against terrorism would achieve “positive results” and said it was impossible to “combat the terrorist threat by destroying statehood”. What about the conflict in Ukraine? France has taken a firm line against Moscow over Russia’s intervention in Ukraine. Western sanctions, imposed after Russia’s annexation of Crimea in 2014, have been ratcheted up since pro-Russian rebels carved out a breakaway region in eastern Ukraine. President Putin used the news conference to call for these sanctions to be lifted, saying they did not help create stability in the east. But both leaders agreed to revive joint working groups, and to reconvene talks with Germany. Did Russia meddle in the French election? Mr Putin appeared to support Mr Macron’s nationalist rival Marine Le Pen during the 2017 presidential campaign. He hosted her in the Kremlin a month before the election’s first round. He also said there was “nothing to discuss” when asked by journalists about allegations Russia has tried to meddle in foreign elections. Before becoming president this month, Mr Macron accused Russia of pursuing “a hybrid strategy combining military intimidation and an information war”. On Monday he accused pro-Kremlin news outlets Russia Today and Sputnik of being “organs of influence and propaganda” against him. President Macron said they discussed the alleged persecution of gay men in the Russian republic of Chechnya, and President Putin had promised “measures aimed at establishing the whole truth about the activities of local authorities”. He said France would remain “vigilant” on the issue. Versailles was chosen for the Macron-Putin meeting because an exhibition dedicated to Tsar Peter the Great is opening there. The tsar’s visit to Paris and other parts of Europe 300 years ago greatly influenced his reign. Ties between Russia and France became increasingly strained under Mr Macron’s predecessor François Hollande. Monday’s meeting was President Macron’s latest diplomatic test after the G7 talks in Sicily and the Nato summit in Brussels where he turned the tables on US President Donald Trump by holding him in a clenched handshake until their knuckles went white. Afterwards, Mr Macron told French media the exchange was “not innocent” and he had wanted to “show he would not make small concessions, not even symbolic ones, but also not overdo things”. France’s Macron Holds ‘Frank Exchange’ with Putin. The French President met with Russian counterpart Vladimir Putin in their first face-to-face talks.